Ethan Beck was born and raised in Vermont. He graduated from Middlebury College in 1996 with a degree in Environmental Studies and Geology. After school he spent his time building homes in Nantucket, Mass. during the summer and coaching ski racing in Colorado during the winter. In 2002 he moved to Portland, Ore., and began working as a project manager for a local builder. 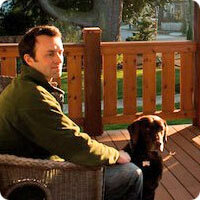 In 2007 he founded Ethan Beck Homes LLC in order to pursue his interest in sustainable and green building practices. Ethan lives in SE Portland with his wife, two young sons and daughter and beloved animals. He spends his free time with his family in the mountains, on a river or at the beach. His interests include flyfishing, skiing and soccer. Growing up in a remote community and a logging family taught Gene a land-based conservation ethic, the value of hard work and essential problem solving skills. He has spent much of his time as a general contractor, with a fair bit of heritage, timber, log, equipment operating and structural insulated panel work. Projects from Antarctica to Suriname have taken Gene to lots of amazing places. 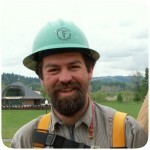 He is a Certified Passive House Consultant and is in charge of the construction aspects of all of our projects. Gene likes to keep his projects safe, organized and efficient. What is the most challenging problem/case you’ve ever worked on? I don’t believe there are any problems only solutions. Within your field, what is the most enjoyable work that you do. What brightens your day? Seeing both of step-sons following in my footsteps. Tell me about your family? I have a beautiful wife of 20 years, five kids ages 32 to 20. 3 grandkids, all of whom still live in the area. We feel really blessed that we can see our kids and grandkids whenever we want. How did you decide you wanted to do this?, My grandfather started this family business, and I continued it. What is the most challenging case you’ve ever worked on? : All jobs have different challenges and knowing how to work through them just comes with experience. Within your field, what is the most enjoyable work that you do. What brightens your day? Rafter cutting, building stairs, and stepping back for a minute to see the work I have done. How did you decide you wanted to do this? We are a family business (three generations of tradesmen). From where do you hail? I’m a Portland native. Tell us about your family? We have a great, close-knit family. Family comes first for us. For fun I love going rafting in the early spring and summer. There’s nothing like going through a class 4 or 5 rapid with five other people in a raft, all relying on each other to make it through. I would love to be a racing horse. I’m a very competitive and hard working person and there’s nothing I would love better than to be a top ranked horse running against other great horses. I would be one of those horses that stared down other horses and tried to intimidate them with bucking, kicking, and snarling. I have a lovely wife and three beautiful kids. They all take after my wife Karen. All three are very smart the oldest Kaitlyn, 13, will most likely be Valedictorian. Dominic, 10, loves building legos, models, and skeletons of dinosaurs. Crista, 7, loves playing with barbies and getting homework to do. How did you decide you wanted to do this? (Is there an interesting story behind it?) I was a custom home builder my entire career until I concluded, about three years ago, that I wanted to shift the focus of my life’s work to helping builders produce truly high performance homes that had a very small environmental footprint. Within your field, what is the most enjoyable work that you do. What brightens your day? The most fun I have is seeing the A-Ha moment when one subcontractor begins instructing another subcontractor on the finer points of building high performance homes in our introductory meetings to describe program requirements for building a green home. Are you native to Portland? I moved here almost two years ago specifically to take this position with Earth Advantage. I’ve spent most of my life in the northern Virginia suburbs of Washington, DC. I was born in St. Louis and split my childhood between there and Milan.